Is my office bugged? If this is a question you have found yourself asking, then it is time to consider having your office swept for bugs. But with so many companies offering such services, knowing which the best one to choose is can be difficult. Look out for these key skills. Where your business is concerned the first, and most important, key skill you expect from your counter surveillance team is confidentiality. If you have been under surveillance, this information could make everyone from investors to clients and staff very nervous, so the fewer people who know about it, the better. Reliability is also important; you want to know that the team will turn up and complete the job when they agreed to. Putting off the bug sweep, or continually needing to re-arrange appointments to discuss the problem, puts your business at unnecessary risk. You will also want your detecting to be thorough. The last thing you need is for them to miss a camera or device and for the individual who is spying on you to continue to have access to your business. In addition, you of course want your private investigator to have training in using the equipment, and experience of working in your type of environment. It certainly doesn’t hurt for them to have a love for their job either, as this shows that they are more likely to take pride in the service they provide. When all these skills are brought together, you will get a clear and definitive answer to your question and be able to rest easier knowing that any technical bugs have been safely and swiftly identified and removed. No one wants to keep having to ask: is my office bugged? Put your mind at rest and safeguard your company with a full TSCM service from Advanced Sweeping. We understand how important your business is to you and react quickly to remove any threats. 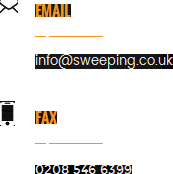 Find out more about us and the services we provide at http://sweeping.co.uk/, or call us securely on 0845 512 1552.